Dialer now is widely used in outbound calling system. Usually, it dials numbers, and switches to agents after the phones are answered. While another plays a record to customers, and switches to agents after finished. Thus, it saves the time which should have been used to dial, wait, deal with vacant numbers and wrong numbers. Agents waiting: when not enough customers answer the calls, some agents will be waiting. Customers waiting: when calls are over-placed, and all agents are on the phone, then the customers who answered phone will be waiting. It would be a waste. So, how does asterCC dialer system avoid such situations and increase working efficiency? Short Call Time: due to the fact that most calls of outbound calling system are short calls, that is, the calls are hung up after the opening, we added short call time(sec). In the parameters above, the system provides a reference value, and administrator can adjust accordingly. When the dialer is placing calls, the parameters can be set to adjust dialing strategy, so as to achieve the balance between agents and customers. 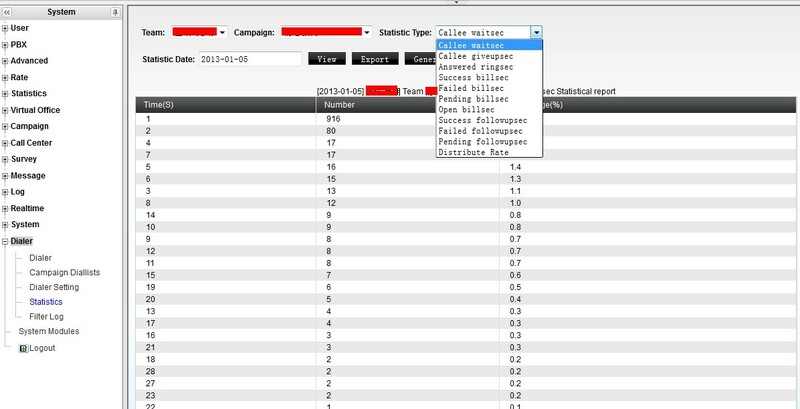 The system also provides dialer statistical statement for references. With asterCC dialer advanced settings, the working efficiency of agents reaches 90%. Take 8 hours for instance, the talk time of agents can attain 5.5 hours, rising by 37.5% compared to the previous conditions without the dialer system.